Done with college? Your hand-me-down 2003 Honda Civic not cutting it anymore? Ready to add some car payments to your crushing student loan debt, like a real adult? If so, Mini’s here with a pretty good offer that won’t break the bank too badly. It’s a fun ride with some nice equipment for under $20,000. 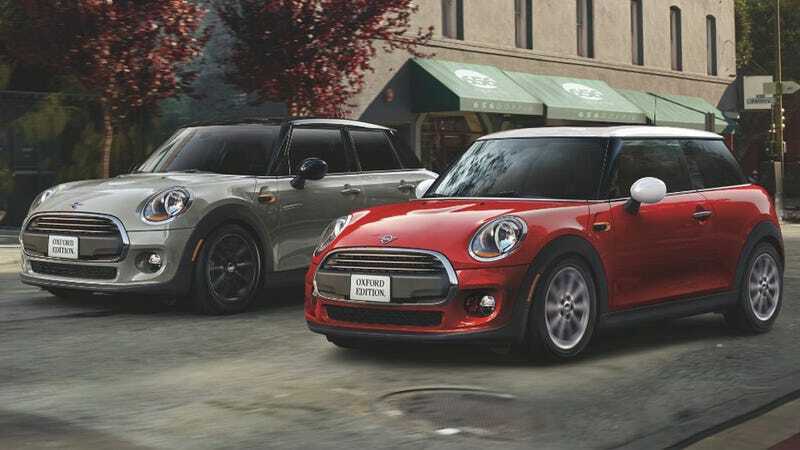 Meet the Mini Cooper Hardtop Oxford Edition. Starting at $19,750 for the Hardtop 2 Door, and $20,750 for the Hardtop 4 Door the Oxford has some nice features for the price. The Cooper Oxford cars are powered by a 1.5-liter, 134 horsepower turbocharged three-cylinder motor with 162 lb-ft of torque. It’s not a rocket ship, but it should provide enough punch to be fun and won’t have you spending a ton of money on fuel with up to 38 mpg on the highway. Fun fact: the three-cylinder Cooper with a stick is one of our favorite ways to configure a modern Mini. With a manual, that little three-banger is a lot of fun to wring out. So where’s the deal? If you were to spec out this car on the regular Coopers it would run you about $2,150 more. But the special discount only applies to current students or recent graduates (within one year) of any accredited two or four-year school. You have to provide a proof of transcript and/or diploma to qualify. Whether or not you think the current crop of Mini’s are still “good cars”, the brand offers something interesting and different from your typical commuter offerings. Mini has had a number of “special editions” over the years but they were often pricey performance edition versions—and these cars are notorious for getting very expensive when you pile on options. The Oxford Edition, however, is a solid deal. Now I was one of those kids who dropped new car money right out of college and I got myself a 2004 Mini Cooper S for $23,500. It probably wasn’t the smartest financial move, but since your first job probably isn’t your dream job, you might as well enjoy the commute. So this is the Mini to get, for sure.